The Mouth Watering Recipe That We Cannot Help But Share! This is the recipe that everyone needs to try. It is very simple to make, good for the body and yummy to indulge. Cook a delicious red palm oil sauce and add it to your beans and yam and you will never enjoy beans and yam again without red palm oil. 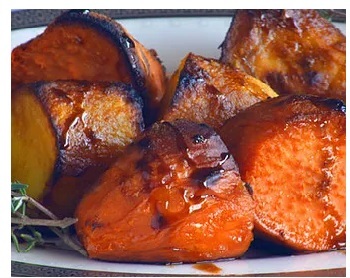 If you do not feel like making this special sauce, you can also simple steam yams, boil your beans and add 2 spoons of red palm oil and a little salt and black pepper and you will taste and enjoy this exotic blends rather easily. Rinse yams and cut up into large size to steam it. Rinse beans and add in a pot, bring to boil and add a pinch of salt “to taste”, once beans are done, be sure to strain out any excess water.. Dice onions, tomatoes and scallion very small. Add olive oil into pot, and bring to heat, add diced veggies including garlic into to the pot, also add bay leaves, tomato paste, habanero pepper, and pinch of salt, stir often while cooking. Cook the above in medium heat for 15 minutes then add 2 spoons of the red palm oil. Cook for another 10 minutes then add the remaining 2 spoons of red palm oil mix it and cook for 5 to 10 mins then you will be ready to serve dinner ( keep in mind the longer you cook this sauce the the better it will taste). Plate your steamed red yam, next to boiled beans and top it with this sauce. You can also add sauteed, fried or baked fish as a side dish to this delicious, mouth watering recipe!